Entrepreneurship is hot right now. It’s everywhere. It’s in the news and on TV. Shark Tank is looped all hours of the day. Colleges and universities are adding entrepreneurship courses for students across the liberal arts, and communities are creating centers to teach seemingly anyone how to make their vision a reality. Here’s what you’ve gotta do. Here’s what you’ve gotta have. Here’s who you need around you. It’s very exciting and a liberating time for creatives of all types. But, even with all of this, no one can tell you what is going to go wrong with your venture. They can prepare you to avoid unforced errors but obviously no one can predict the challenges you and your company specifically will face. And, let’s be honest, focusing on the ugly parts of entrepreneurship doesn’t sell books or TV adds, and tends not to inspire students to chase their dreams. As a result, few are investing in stories and strategies for the grind of iterative survival that for many, if not most, of us is at the heart of the entrepreneurial venture. As I reflect on my first for-profit startup, I’m amazed at how little actually went right. In fact, it seems almost nothing went right. Some of this was our fault, some of it was out of our control, and some of it was just part of being an entrepreneur. So, with some time and space to reflect, I am left to wonder: how did we make it? Very early, my partner was delivering a product demo for teachers at a high school where we were hoping to roll out our technology, and two teachers showed up in workout gear looking for the Zumba class. Our product and company were named Zeumo (‘zoo-mo’), and we were trying to help schools more easily and effectively communicate with and engage their students. The teachers left, mumbling their disinterest in our product demo, disappointed there was no Zumba class. About a year and a half later, Zeumo had pivoted industries into healthcare with the same value proposition: trying to help hospitals more easily and effectively communicate with and engage their physicians. I was doing a product demo for a group of physicians that had taken months to organize when a nurse rolled a cart into the already tight and windowless conference room and asked the physicians to line up to get their flu shots “while you listen to the demo.” My demo was literally going to be coupled with physical pain. We had made the pivot from education into healthcare on the premise of a partnership with a large healthcare company who loved our product and was trying to figure out how to communicate with their physicians. We worked with them for almost 8 months on a “joint venture” and remained patient but persistent as we tried to codify the “joint” part of that venture with financial, marketing, and legal commitments – all of which were very slow coming presumably due to their massive bureaucracy. As we approached the first roll out in one of their flagship hospitals, they finally delivered a pricing model that had us under water and a marketing “plan” that shifted from rollout out at 160 hospitals to “we will introduce you to a few of our CEOs.” It was pretty clear that they were going to hook us, starve us, and buy our technology for pennies when we ran out of cash – which wasn’t long, and they knew it. So, we (6 of us strong with no healthcare experience and little cash) walked away from one of the largest, most successful healthcare companies in the country. If we were going to die, we weren’t going to die like that. Another year later, when Zeumo was ultimately acquired by a different healthcare company, there was immediate rub within the new company with its product teams and marketers because they all believed they already had built the same technology as Zeumo. The acquisition apparently made little sense except to the people who had led it, and they were not a part of any of those teams. After some surprisingly complicated sleuthing on my part, much of it sadly with people with little knowledge of either product but resistance to ours, it turned out that the products couldn’t have been more different – the company’s product queried physician performance metrics and Zeumo was a mobile communication platform. But, there was a marketing story for the company’s product that included the idea of communicating those performance metrics with physicians. So, communication. Physicians. It must do the same thing as Zeumo, right? While ironing that out to try and get a better sense of buy-in from the new company, we were also exploring the opportunities to deliver on the value proposition of our acquisition – rolling out our communication platform for physicians but enriching it with the acquiring company’s research and data assets to deliver targeted content and drive physician utilization. To make another long story short, neither their research nor data were organized or stored in such a way that we could easily or reasonably distribute them through our communication tool. In fact, their sales and membership models, which organized their relationships to buyers, didn’t even support the cross-product concept at the time. So, at this point, the value proposition of our acquisition was deeply in question. Did I mention that we had built a nice little product that did exactly what it said it would do? The fact is that the variables involved in a successful venture are vast – some controllable and some not. And, the ideas for products and services we start with are always at least a little, and more likely a lot, wrong. For us, this was as true at the inception of our product as it was at the point of our acquisition. Figuring out what to do when stuff goes wrong is, at least in my experience, the core to becoming a successful entrepreneur. And, I should note that this is a universal truth from my work as an artist, an organizer, a consultant, and in nonprofit leadership. So, what do we do when things don’t go our way? Is there a competitor we didn’t know about or didn’t understand fully? Is there a competitor we had no idea would be a competitor? Is there a competitor for critical financial or other bandwidth for our buyer even if it isn’t a direct product or service competitor? Is our message resonating like we hoped? Did we have the right audience in mind? Is it resonating but not driving an urgency to buy? Is it resonating but running into other hurdles? Is there something about our buyer and their business and buying cycles that has hurt our prospects? Is the timing issue controllable by us? Can we overcome it? Is our buyer more/less price sensitive than we expected? Is our price signaling something we didn’t expect – too low, too high? Is our pricing putting us in or out of competition with another product or service causing the buyer to make unforeseen tradeoffs? Do we understand the value proposition differently than when we started? What have we learned and have we rolled that into our product strategy, marketing, messaging and so forth? Can our user figure out how intuitively to use our product or service and name why they want and need to? Are we building the right product for the intended user? Have we found that the user we expected is either no longer the primary user or perhaps not a user at all? Is our buyer the same as our user? Have we adjusted marketing, messaging, etc. accordingly? Have we tweaked feature sets or service offerings to be more directed at the new user? Again, have we rolled our learning into our strategy? Are we executing as a team? Are we including our learning into product direction? Are we building what we say we are going to build roughly in the time we say we are going to build it? Are we accumulating acceptable levels of technical or design debt? Is our problem a combination of these things and many more including just plain randomness? Probably. Define for yourself/your team a new strategic direction or milestone (new feature launch, pricing change, messaging tweaks, etc.) that you think will impact the problem as you now understand it. Give yourself/your team a timeframe or other boundaries for how and when you will evaluate your strategic adjustments. Seek feedback, listen, and iterate more rapidly than ever before. Focus on solving a problem for the user as quickly and effectively as possible. 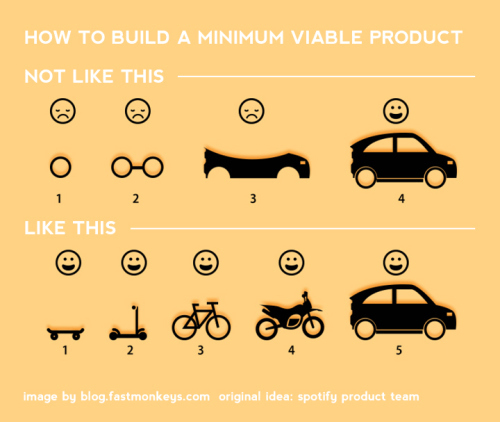 Use minimum viable product thinking for new iterations/features and avoid rabbit holes. Don’t accumulate features just to try and impact sales (or if you do, know that’s what you are doing and start planning to come back and clean it up). A pile of good features doesn’t necessarily create a good solution for your user. Balance early, understandably narrow feedback with the larger vision and value proposition. Avoid giving undue weight to 1 user even if that’s a quarter of your user base. Remind yourself and each other why you took on a startup. Make sure all members of your team maintain ownership of tweaks in strategy and direction. Ensure the full range of team perspectives and pressures have voice. Different people (sales, product, engineering) see the world differently and hear feedback differently, which can then drive differing priorities. Maintain energy and hustle by involving the team in the whole process of iteration so it doesn’t feel like a game of failure-turned-survival but rather a creative reality of your work together. Be proactive about product developments, directions, and try to align it with the value they already get from your product. Seek their feedback (especially those who “get” your product) and recognize/thank them them when they offer valuable insights. Think in terms of customer service even if that doesn’t traditionally match how you think about your work. Keep your investors and other interested parties clear on your value proposition and confident in your direction. Capture and share small success stories that prove the value proposition despite the challenges you are facing. In reality, the questions, steps, and processes offered here for when things don’t go your way should just become a part of how you do your business daily. If they do, you will always be ready when things go wrong and won’t have to wonder how you will respond if they do.